As soon as I saw the inspiration picture over at Inkspirational I knew I needed to play with them. and then things just fell into place. 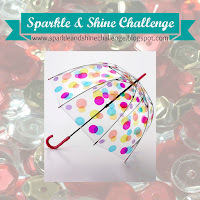 and Sparkle and Shine offers an umbrella, although theirs has colorful polka dots, oh well, mine does not. I took that cool umbrella stamp from Joy Clair, did some masking and sponging on grey card stock. 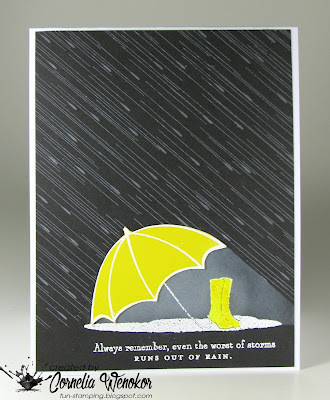 The raindrops are by Impression obsession and the sentiment is by Papertrey. So, what do you think - is that a perfect coincidence??? It's not raining now, but its coming - so - keep stamping! Don't you just love it when that happens? The most perfect card for the challenges. 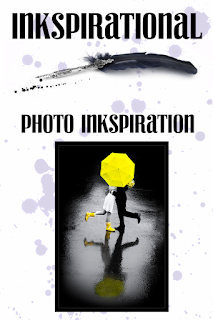 The bold yellow and black photo inspiration is so striking and no wonder you wanted to join in. Absolutely fabulous take and would never have thought to start on the grey card, so thank you for the inspiration x Great sentiment too. Seriously I want your brain! The way you create such inspired cards - I can only aspire! This is [for sure] a winner again no doubt. Fabulous! Thanks for joining us at JUGS too! This is fantastic! I love the design and colour choices. Gorgeous card, well done! Well, this is just plain genius!!! 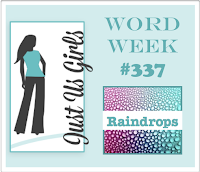 You explained how you did it, but I still can't figure out how you did the raindrops and colored the umbrella and boots. I love this so much, great take on the challenge. Thanks so much for playing along with us this week at Just Us Girls!! Woohoo! Impressive collections of challenges you just met. And how you met them is absolutely stunning. Fabulous encoragement card. Looks dead on perfect. Echt schön und perfekt für diese Challenge! Gorgeous - so dramatic and perfectly represents the words in your sentiment! Co-incidence or not, its one amazing card, Cornelia! 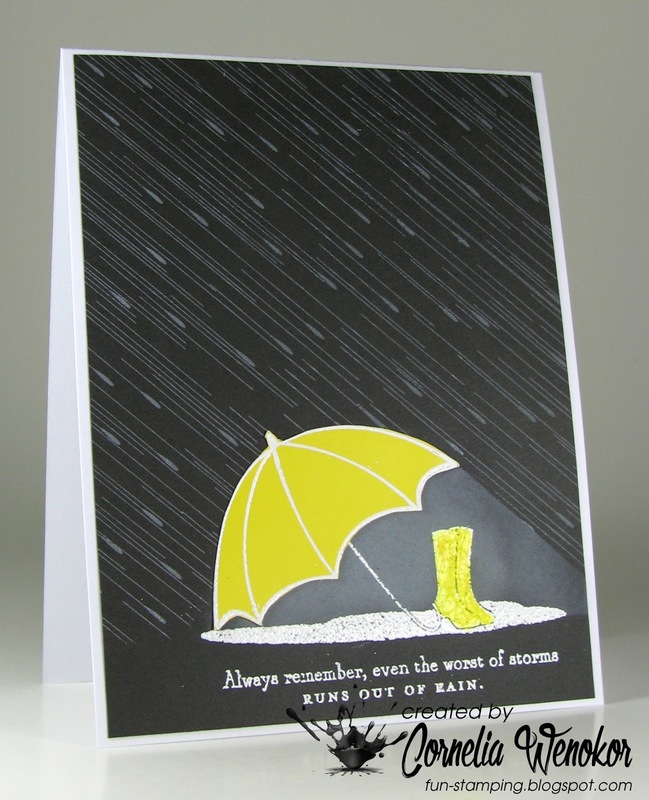 The yellow stands out so well on the grey and the grey depicting a storm and the sentiment suits perfectly,- that's just one beautiful card! This is a stunning card. I love everything about it and the masking and sponging is very clever. Och nö, Regen will ich jetzt erst mal nicht, aber Deine Karte ist grandios, sieht so echt aus der Regen. Oh je!!! Bei dir regnet es aber heftig!!! Sehr schön ist deine Karte geworden. WOW this card has such impact and the sentiment is wonderful! A superb card, wonderful focal point !! What an awesome card! Love that rainy background! Very clever! Thanks for sharing! Another amazing card!!!! So glad you linked up with us at JUGS or I may have missed this gem! Really quite incredible! LOVE it. WOW - just like magic. Great take on the challenges. Thanks for playing along with us at Sparkle & Shine. This really stood out in the LIM gallery what a beautiful card I absolutely adore it. What a clever design! Love it! And the sentiment is great too! Thanks for playing with Just Us Girls! FAB design, colour and sentiment! Now THAT'S a LOT of rain ... and that's how you knock those challenges out of the park! Great card, Cornelia! Wow! That is a very nice coincidence! I'm impressed at how you were able to make such a beautiful card including the elements of all the challenges. Well done! Congrats on your win at JUGS!! This card is so fantastic!! What a gorgeous card, Cornelia!!! Love the yellow umbrella over the yellow shoes on the dark grey background! And the rain and the sentiment!!! Every detail on your card is fabulous! Wowsers, Cornelia, this is stunning! Such an impact from the yellow on black, and brilliantly executed. Adding my voice to the others in cheering and applauding your amazing card! The rain, the umbrella, the boots, the sentiment: WOWed completely! Congrats on being singled out at Sparkle & Shine. So well deserved.